Nineteen years after the events of Unbreakable and not long after those of Split; vigilante David Dunn, who has now come to be known as the ‘Overseer’; and Kevin Wendell Crumb, a young man suffering from Dissociative Identity Disorder, who is on a mission to rid the world of those he deems impure; are gathered at a psychiatric hospital called Raven Hill Memorial by a one Dr. Ellie Staple. Here, Dunn comes face to face with the criminal mastermind who caused the train accident that killed his wife: Elijah Price, also known as Mr. Glass. However, just what manner of events would unfold from this unlikely reunion—and how many would lose their lives in the process? Glass begins with a dark and foreboding atmosphere as it reveals Kevin Crumb, played by James McAvoy (in one of his two dozen alternate personas, Patricia), talking to a group of cheerleaders who have been captured by ‘The Horde’ (the collective term for all his personalities), in order to be slain. Then it cuts to David Dunn, portrayed by Bruce Willis, who breaks into a house to attack two youths who had not long before assaulted a pedestrian at random. 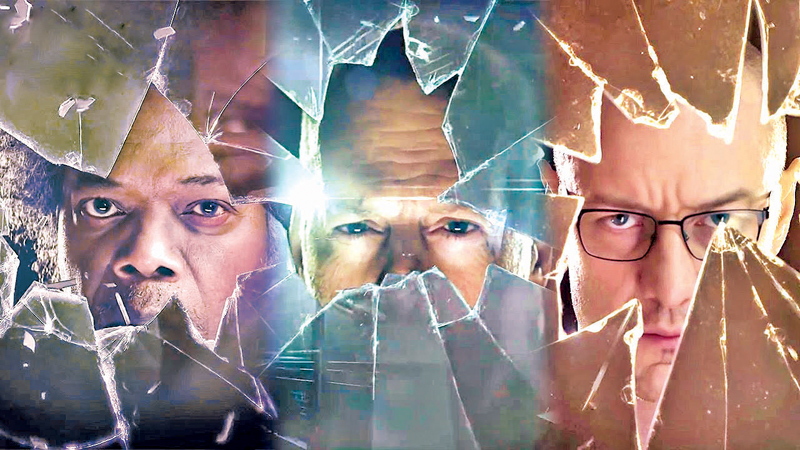 While reintroducing the audience to characters from its predecessors, Glass builds a near perfect setting for their individual traits to be accentuated. There’s a striking equilibrium between the lighting and the scores, which holds a compelling allure to the more suspenseful and mysterious scenes. However, there are times when the movie seems rather void of music; making some of the conversations, which are rather compelling, come off as bland. Furthermore, certain transitions in this film are either rushed or disjointed, with one scene related to Mr. Glass (Samuel L. Jackson) and a few others related to Dr. Staples (Sarah Paulson), feeling as if they were of forced exposition. Another noticeable weakness this film bears is poor editing. There are a number of scenes that are either slow or unnecessary, with some taking too long to discuss the specifics of psychology-related topics, while others impede the flow of the plot. This, coupled with the sluggish choreography, also makes the very few action scenes in the movie underwhelming—the only compelling sights in them to behold are that of Crumb’s Beast persona displaying his brilliant acrobatic skills, from scaling pillars and walls to leaping great lengths. Considering the plot and direction, M. Night Shyamalan has a fine approach to the Superhero genre in this movie: there is a greater focus on the psychological aspects associated with how the main trio’s traumatic pasts have shaped them into the people they are today, while also making them question the foundations of the beliefs and characteristics they’ve adopted over time to deal with those events. We see glimpses into their troubled pasts and are able to understand the impact of such experiences on their minds. And the cinematography also aids in amplifying this, with the use of close-up shots that capture the characters’ perturbed and perplexed expressions (though such shots are also, at times, overused in this movie). The performances of the main characters are enthralling regardless of the film’s flaws. However, Dunn does not receive enough screen time to shine as a leading character and is shadowed by Crumb and Glass. That being said, this movie has a rather slow buildup for Mr. Glass to take on the role of the active antagonist and criminal mastermind he’s supposed to be. The chemistry between Crumb and Glass is well-wrought, with the Beast wreaking havoc while Glass sets his sinister plan in motion. Another noteworthy character, who plays an integral role in sowing the seed of doubt within the main characters’ minds about their superhuman abilities, is Dr. Staples. Willis’ and McAvoy’s expressions of anguish and desperation in those scenes are quite moving, adding more depth and dimensions to their roles. Finally, this movie’s most pronounced and perhaps biggest flaw is its ending. The Third Act of the film reveals two main plot twists, however, they both were tragically anticlimactic. There is neither the slightest hint nor the smallest buildup for the first twist, of which the magnitude is so great it deserves some form of foreshadowing. The second plot twist, although infused with a more positive message, feels underwhelming as it is still linked to the previous one. Although Glass delivers compelling characters with an intriguing direction, its flawed flow and incoherent ending shatter its chances of reaching the great heights it could have.